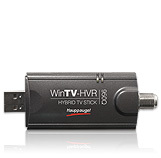 I recently indulged in two gadgets from Hauppauge that have turned one of my PC's on my home network into a Tivo style PVR. ...and a Wireless MediaMVP player. I took a while to configure these toys but the end result seems to be pretty good.